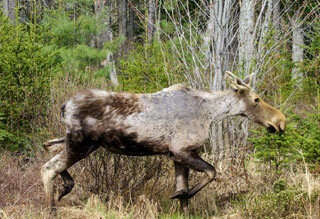 What's in store for New Hampshire's moose? Counting ticks. Select image for larger view. A multi-year study is underway in New Hampshire to learn more about threats facing the moose population, including winter tick. The study began in 2014. 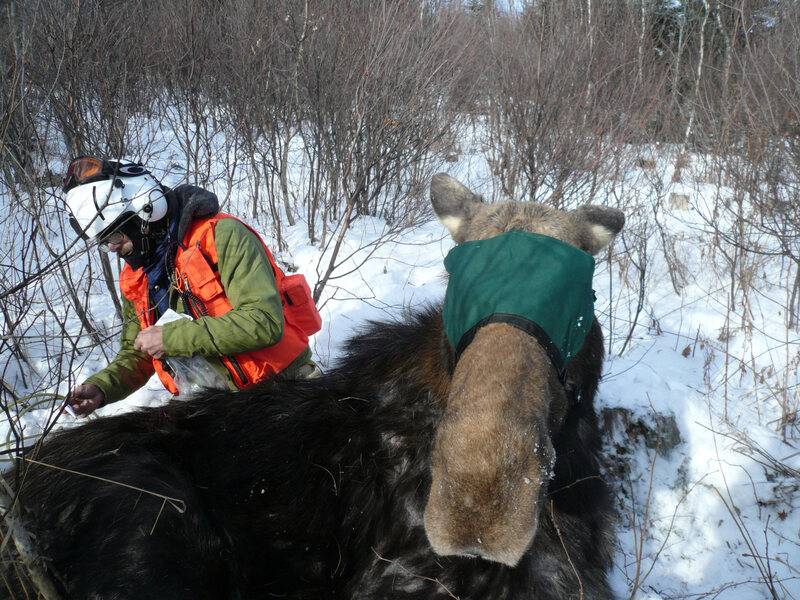 Moose Study Video: Watch a video of moose being collared in New Hampshire for this study. 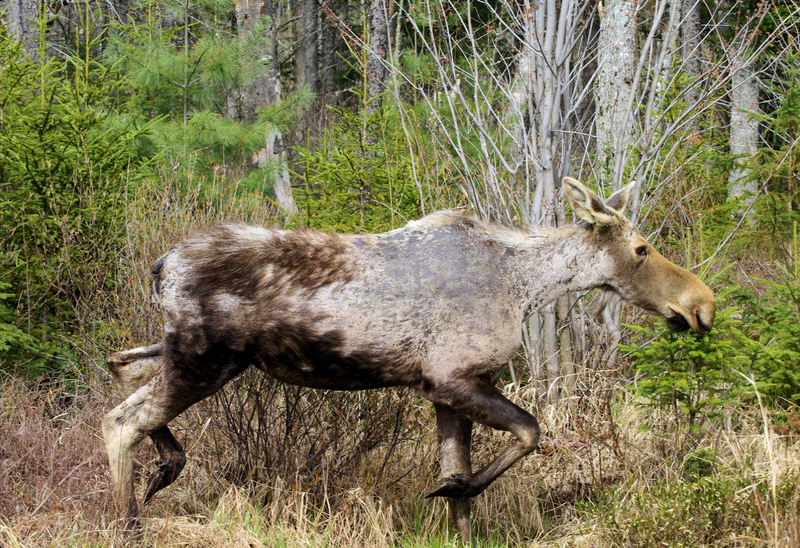 "While regional moose populations are indeed facing some serious threats, moose are not on the verge of disappearing from the New Hampshire landscape, but they are declining," said NH Fish and Game biologist Kristine Rines. "We don't know what the future holds, but as our winters continue to shorten, it may be best for moose if they are held at much lower densities. 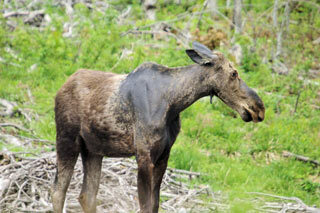 Based on our own work, we know that ticks have far less impact when moose densities are 0.25/square mile or less." 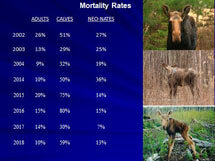 Current moose densities in the New Hampshire study area range from 1.14-1.71 moose/square mile. Select images for larger view. 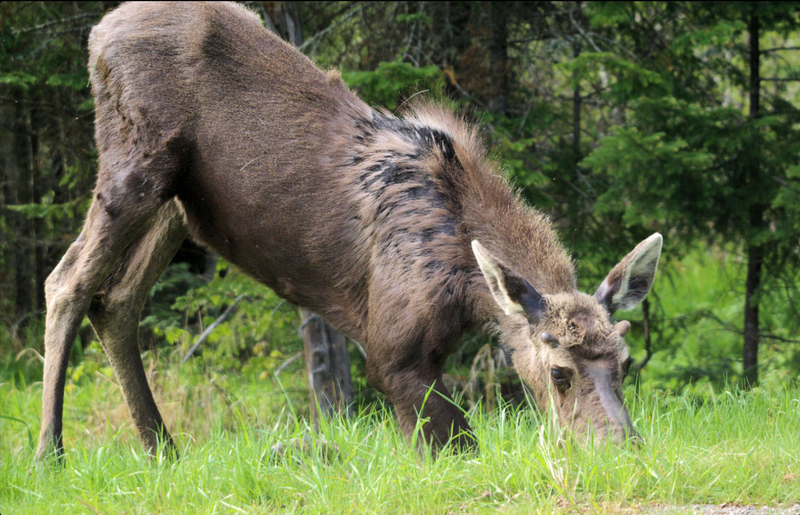 Moose are being collared in Maine, New Hampshire, and Vermont, as the three states work together to learn how moose density and weather interact to boost tick-caused moose mortality and reduce moose birth rates. 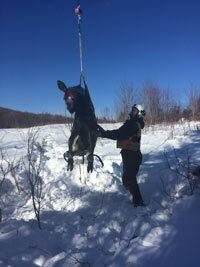 In New Hampshire, the F&G Department has partnered with UNH to study our moose. 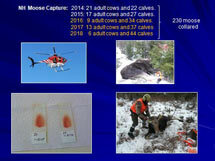 Approximately 45 moose cows and calves were collared in each year from 2014-2017, and 50 in 2018, for this study of moose mortality and productivity. In NH the capture company Native Range, has collared moose in the towns of Success, Berlin, Milan, Cambridge, Dummer, Millsfield, Second College Grant, Wentworth’s Location, and Errol (Wildlife Management Unit C2 and the eastern side of WMUs B and C1 and southern A2). 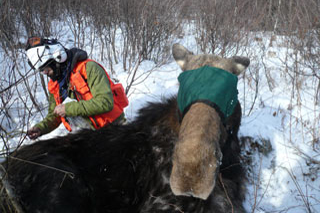 The Native Range capture crew uses net-guns and tranquilizer darts to capture the moose in order to collar them. 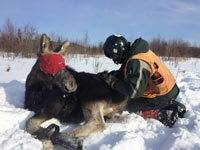 Blood and other samples collected during collaring are used to help evaluate the health of the moose. 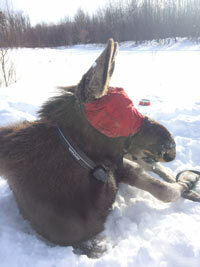 The collared animals are radio-tracked and monitored for as long as the collars keep transmitting. 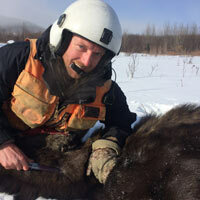 Graduate students from the University of New Hampshire, are tracking the moose, recording how long the individual moose live, and when a moose dies, getting there as soon as possible to determine the cause of death. They also are monitoring the collared adult cows to determine how many calves they have and if these “neo-nates” (young calves) live through their first summer. "This work is giving us important data on how calf and adult moose mortality and adult reproduction is affected by differing tick loads and moose densities," explains Rines. "It is also showing us how our changing climate is resulting in much shorter winters which is good for ticks and bad for moose." "In comparing mortality and productivity from the New Hampshire study conducted in 2001-2006, versus the work done to date in New Hampshire from 2014-2018, we know that ticks are causing increasingly negative impacts to adult cow productivity," said Rines. "In addition, as our winters become consistently shorter, more ticks are surviving and calf mortality is remaining high. We are also seeing clear evidence that tick loads are directly correlated with both moose density and shorter winters. 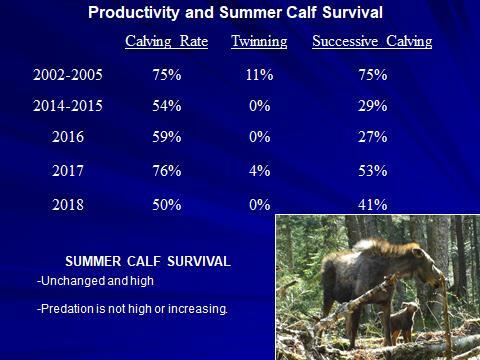 We did see a reduction in calf mortality in spring of 2017 as the preceeding summer-fall drought caused many ticks to die, lessening the impacts to moose." The following tables show the number of animals captured and collared each year of this study; and the productivity of cows and survivability of new born calves through their first summer (neo-nates), and the mortality rates of adults, calves collared in the designated winter and neo-nates (select image for larger view). 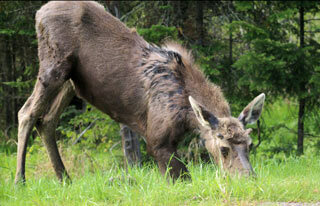 "It's clear that shorter winters are increasing parasite loads for moose, in this case winter ticks. Maine and Vermont are seeing similar mortality and productivity trends. 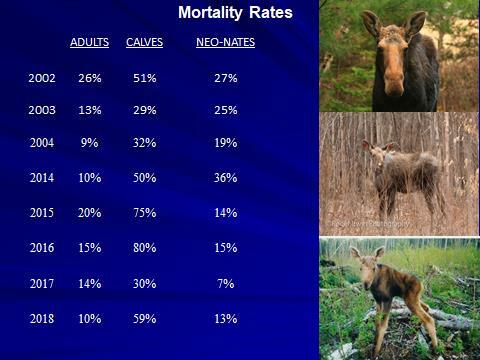 The northern Maine study site which still has long winters, is not seeing this level of mortality or decline in productivity for it’s moose. 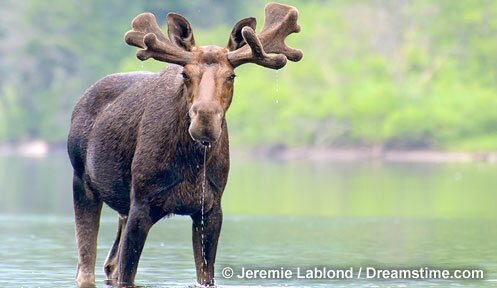 Our changing climate is changing the environment in which we live and decreasing it’s ability to hold moose. 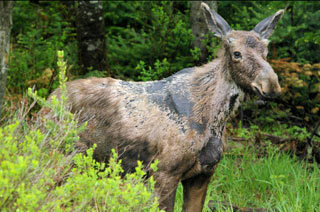 Read Kristine Rines' article, What's Bugging Our Moose in the November/December 2014 NH Wildlife Journal. 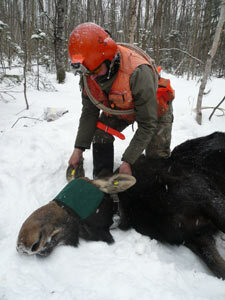 New Hampshire moose being collared in 2014 for a study of the impact of winter tick and other health threats. Select image for larger size. NHFG Photo. UNH graduate students count ticks found on the hide of a collared moose that died. This individual was carrying thousands of ticks.Select image for larger size. Ghost mosse -- affected by winter ticks. Many thanks to the Native Range crew, who are extremely professional, hard-working and exemplary animal handlers and data collectors. 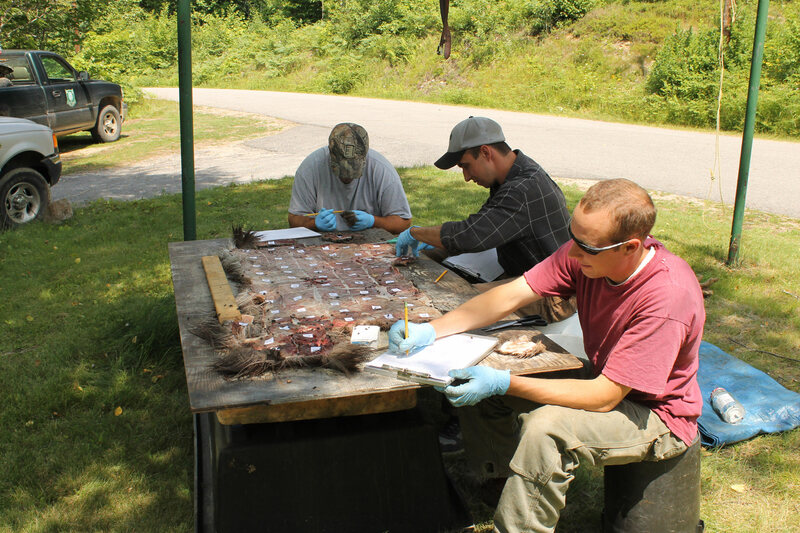 NH Fish and Game also owes a debt of thanks to Dr. Peter Pekins of UNH, who is doing his usual wonderful job of overseeing this project and making sure the Department gets useful information that can be utilized for management decision-making. There is no better wildlife professor with whom to collaborate! Thank you, as well, to Fish and Game biologists Will Staats and Andy Timmins and Berlin Fish Hatchery Manager Wayne Paschal for their unwavering help and support of the field work. This project could not be done without you. And last but not least, many thanks to the current UNH master’s candidate, Dan Ellingwood, and his crew; they are reliable, accurate, professional, cheerful in all weathers. We could not have a better crew! The study is funded by federal Wildlife Restoration Program dollars, with the support of matching funds from the University of New Hampshire. It may help answer a question on the mind of many Granite State residents and visitors: What's in store for New Hampshire moose?